2176 West 41 st Ave.
2176 West 41st Avenue, Vancouver B.C. 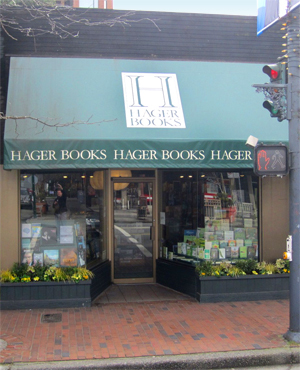 Hager Books was established in 1974 and is located in the west side Vancouver neighbourhood of Kerrisdale. We have a wide selection of fiction, biography, travel, psychology, history and of course, cookery and gardening. There's also a good choice of art and decorating books from renaissance to 21st century, Michelangelo to Picasso, as well as recent architecture, cinema and photography. Our children's book section draws all age groups and everything is there, from Beatrix Potter and before, to J.K.Rowling and beyond. We select our books very carefully with our customers in mind but there isn't room on the shelves for everything. Of course we do have the latest releases, but if what you are looking for is not in stock, then we can pretty well order anything you want that's still in print and and usually get it quickly. to help you choose books for yourself or for your friends. We are happy to give your book club ideas about good books to read and discuss.